Although Rincon is most widely acclaimed for its spectacular surfing and striking sunsets, many tourists have also discovered the delights of one of the town's best-kept secrets: whale-watching. During their journey back to the North Atlantic each summer, migrating humpback whales pass by the Rincon coastline while mating and giving birth, entertaining beachcombers with their melodious, underwater mating songs. 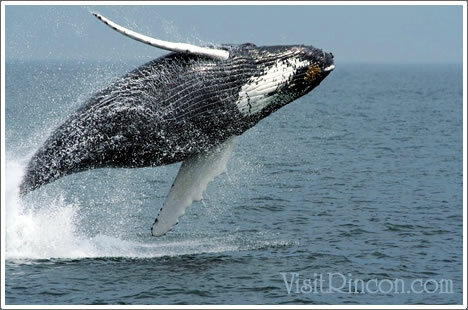 The whales spotted in Rincon originated from such far-flung areas as New England, Iceland, and Newfoundland. The humpback whale is a truly majestic creature, reaching lengths of up to 50 feet and weighing in at a staggering 50 tons. Every 15-30 minutes, the whales rise to the water's surface to replenish their oxygen supply and afford spectators a quick glimpse before diving back down to depths of up to 700 feet. With their gentle dispositions and substantial size, humpback whales were once poached almost to the point of extinction. There are currently 15,000 humpback whales in the world. Their rarity and their impressive presence make each sighting a truly thrilling experience. Today, the humpback whale remains on the Endangered Species List. Rincon offers the most whale sightings in all of Puerto Rico during the prime season (January through March, peaking in February). The observation park at the historic El Faro Lighthouse serves as a prime vantage point for whale-watching, with binocular-wielding tourists lined up most every day. Also known as Parque El Faro de Rincon (Rincon's Lighthouse Park), the site is located at the western edge of the town, attracting locals and tourists alike. The Mona Passage is another popular spot for whale-watching. Most activity is reported early in the day (before 10 AM) and during the evenings. West Coast Charters: This acclaimed tour company hosts several whale-watching expeditions between December and March. Call 787-823-4114 for details. Oceans Unlimited: This dive charter operation offers whale-watching trips for Rincon and the entire west coast of the island. Call 787-823-2340 for information. Taino Divers: Located at the Black Eagle Marina, their boats head out for whale sightings and sunset cruises. Call 787-823-6429 to reserve a spot.